I believe that a B2B company’s website is more than an online catalog. A proper website is an efficient tool to attain sales leads and partnership opportunities. Your Chinese sales team can only do so much in a country with such a dynamic economy and a vast surface. This is when a website comes in handy. Focus on a series of best practices and dedicate a fraction of your marketing effort on the online. Thus, your customer and partner networks in China will thrive. My pieces of advice are worthless if your website is not in Chinese. Baidu will not index it, Chinese customers will not find it. Do not opt for a classic translation of your foreign content. Think about you customers in China and adapt your content to their profile. Use an employee who is fluent in Chinese and make most of every word. If you do not have a viable candidate, choose an agency which can localize it into Chinese. Before talking about your website’s design or content, you must ensure that you contract hosting services in China or Hong Kong. Your visitors expect to wait 2 seconds for your website to load. Such a speed is attainable only if you choose a Chinese server for hosting. However, to host in mainland China, you need a special license from the Chinese authorities, i.e. ICP Beian License. The precursor to this license is you must have a local entity presence. If you do not, hosting your website in Hong Kong is your best option. Baidu rankings are also affected by the loading speed of your website. The de facto search engine in China loves fast-loading websites, which end up having a good ranking on Baidu. Of course, your website will be indexed no matter the speed. But having it hosted nearby means that more pages will be indexed more frequently. For optimum results, pair your website with a Content Delivery Network. When you choose a Hong Kong server, make sure it has dedicated lines to Chinese telecom operators. At Twinova, we offer both China and Hong Kong hosting. Just like Google, Baidu has Search Engine Marketing (SEM) services, similar to AdWords, that you can use when you want to advertise based on industry relevant-keywords. If you are not ready to spend your money on a Baidu SEM campaign, you should at least apply for Baidu Webmaster Tools for your website. You can thus keep track of the web pages that are being indexed. Setting a Baidu SEM account can be a painstaking task for a foreign company. Let us set you up and you can later manage it on your own, if you wish. Are you using videos to showcase products and services? You need to make them available to your Chinese audience. YouTube is one of the many platforms blocked in China. While available, Vimeo has a slow loading speed that makes it unreliable. A professional video platform allows you to white-label your videos, so your customers are not distracted by third-party logos or ads. Outside China, companies turn to e-mails when they decide to build a newsletter service. In China, the story is different. E-mail has never been important for the Chinese in the first place, due to the unique internet-cultural developments. 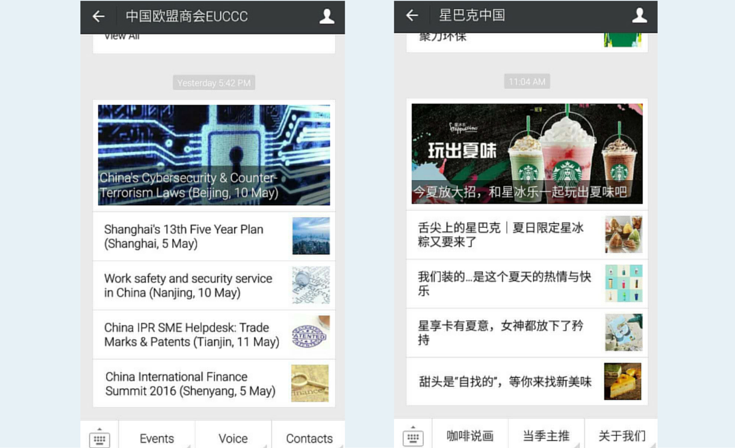 Chinese companies turn to WeChat for newsletter-like services. WeChat is a mobile social platform where practically every Chinese internet user has an account on. There is a huge segment of members who do not have an e-mail, but a WeChat account. Even when a Chinese user has an e-mail account, they seldom access it as much as they do their WeChat. More than half of the WeChat population accesses their WeChat account at least 10 times a day. WeChat allows organizations to setup Official Accounts on the platform. There are currently around 8 million organizations on WeChat, ranging from township to police departments and from small businesses to big corporations. Even if you decide to continue sending the classic email newsletter, join WeChat! You will thus double your communication channels! Even if you are in the B2B business, your clients are still WeChat users in their free time! A Chinese entity is needed to register for an official WeChat account. If this is an issue to you, we can assist in obtaining an account through third parties. As I mentioned before, the e-mail was never an integral part of the Chinese digital life. Netizens are impatient when it comes to getting answers when browsing your website. These are two of the reasons why you should not solely rely on the possibility that users will fire up their email client and send you an inquiry. A better and safer option to capture all potential online inquiries or interests is to serve an instant online chat tool. Chinese visitors can ask questions in real-time, directly on the website. Implementing an online chat tool and having at least a customer representative to service the visitors’ inquiries is one of the golden rule of thumb for B2B businesses in China. There are several options when it comes to implementing an online chat tool. Two of the most popular are Shangqiao, from Baidu, and Business QQ, from Tencent. Once you have a customer representative assigned to service customer inquiries on your website, you could also assign him/her to service inquiries made from users on your WeChat Official Account. No assessment of the Chinese market is complete without talking about mobile internet. As you might have guessed, internet mobile is big in China. How big? More than 668 million people currently use their smartphone to browse, book, buy and transfer money.